Harvard’s 1968 crew feeling at home on the banks of the Charles River. NEW LONDON, Conn. — They came back on Saturday to revisit Red Top, the enchanted place by the Thames River from where the 1968 Harvard crew embarked upon the magical mystery tour that brought them to Olympus and has bound them together for 45 years. Harry Parker — no last name needed now or then — still is coaching the varsity, and Sunday morning he’ll be marking the 50th anniversary of his first year at the helm when he sends out his boat for the 148th 4-miler with archrival Yale. “It would have been incredible to me if the coach of the 1914 crew that won the Grand Challenge Cup at Henley had still been around when I turned up in 1964,” says Andy Larkin, who rowed in the 1968 boat. Little has changed since that crew left the Bulldogs in its backwash here. The distance, unique in American collegiate rowing, is the same. The crimson jerseys with the white H are the same. And the bond among the oarsmen, who came from Concord and Sacramento and Salt Lake City and Cincinnati and the Virgin Islands and points between, is the same. 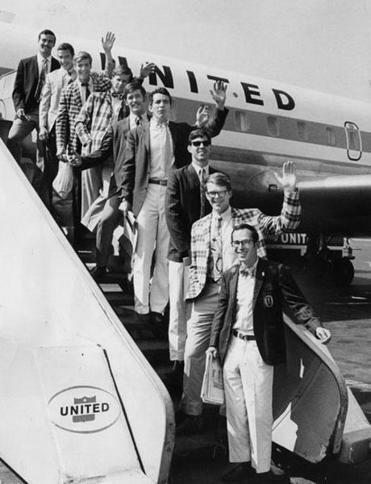 Harvard’s 1968 crew set to embark on the flight to California for the Olympic trials. Except for Brooks, who’d rowed at Noble and Greenough, the oarsmen were a collection of former football and basketball players, runners and swimmers who for one reason or another found their way to Newell Boathouse, the creaking Victorian torture chamber on the Charles. When Canning, Larkin, and their classmates signed on in the autumn of 1964, five-ringed fever was rampant at Newell. Though the varsity had lost the Olympic trials to Vesper, the Philadelphia club that went on to win the gold medal in Tokyo, five of its members had competed in fours at the Games, with Geoff Picard winning a bronze, and Ted Washburn, who’d coxed them, was freshman coach. All but one of the Tokyo veterans still were around, and they formed the 1965 boat that Sports Illustrated featured on its cover as the “World’s Best Crew.” “We were in awe,” remembers Canning. And Parker, who’d made the Olympic sculling final in 1960, was all but deified. “It was like we were doing martial arts, with Harry the Zen master,” says Larkin. The summer of 1967 convinced not only the Crimson oarsmen but the rest of the rowing planet that they belonged in the fast lane. After winning the Pan American Games, Harvard went to France for the European championships and finished second to West Germany in what essentially was a preview of the Olympic final. The junior varsity was so strong that two of its members, Monk Terry and Charlie Hamlin, ended up making the US straight four that finished fifth at the Games. The varsity went unchallenged, winning its fifth straight Eastern Sprints crown and beating Yale on the Thames by a dozen lengths, the biggest margin since 1911. But when Harvard arrived in Long Beach, Calif., for the Olympic trials it found a decidedly more formidable Penn boat than the one it had beaten twice, with two new faces in the lineup. “It was a mighty battle,” recalls Larkin. But some of his oarsmen got ill during altitude training in Colorado and were sapped by Mexico City’s mile-and-a-half height and more sickness. Art Evans, the boat’s smooth stroke, had to be replaced after the heats, with former captain Jake Fiechter filling Brooks’s original seat, and it took an heroic effort in the second-chance repechage, with Harvard coming from last place midway along, to finish second and make the six-boat final. Should the urge return for one last paddle on Sunday morning, there’s a spare shell in the boathouse. Hoffman knows the course by heart. And if they’ve misplaced their original jerseys, Harry has a few he can spare.